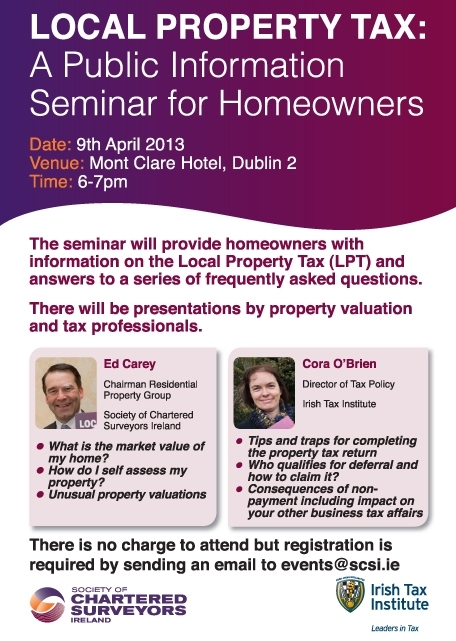 The Society of Chartered Surveyors Ireland and the Irish Tax Institute will host a free public information seminar on property tax and valuations on Tuesday 9th April in the Mont Clare Hotel in Dublin at 6pm. Booking is required by emailing: events@scsi.ie . The SCSI and Irish Tax Institute, the largest professional bodies in the property and taxation sectors say the seminar will provide key pieces of information and advice to homeowners who are currently receiving Local Property Tax (LPT) returns from Revenue. • How do I self-assess my property? • The value from the Revenue website is lower than the estimate – which do I pay? • I have a granny flat adjoining my house – am I liable for Property Tax on this? • Our Property is in the middle of a farm – what is included in the valuation? Roland O’Connell, President of the Society of Chartered Surveyors Ireland said “Property valuers and tax advisers have been inundated with questions around property tax. It is important the homeowners correctly self-assess the value of their property and use all of the available online tools”. Irish Tax Institute President Martin Phelan said “The property tax is a self-assessment tax. We would like to provide homeowners with additional support, especially the many people who are engaging in a self-assessment process with Revenue for the very first time. “We hope that this initiative will help homeowners to complete their Local Property Tax (LPT) returns and that it will complement the comprehensive public information provided by the Revenue Commissioners”, concluded Mr. Phelan.